I was talking to a fellow fountain pen enthusiast a couple of months ago at a local pen club meet, and he showed me a beautiful, clear eye-dropper fountain pen that he purchased from eBay for less than $20. The bright orange ink sloshing around inside the big, empty, clear body looked great. 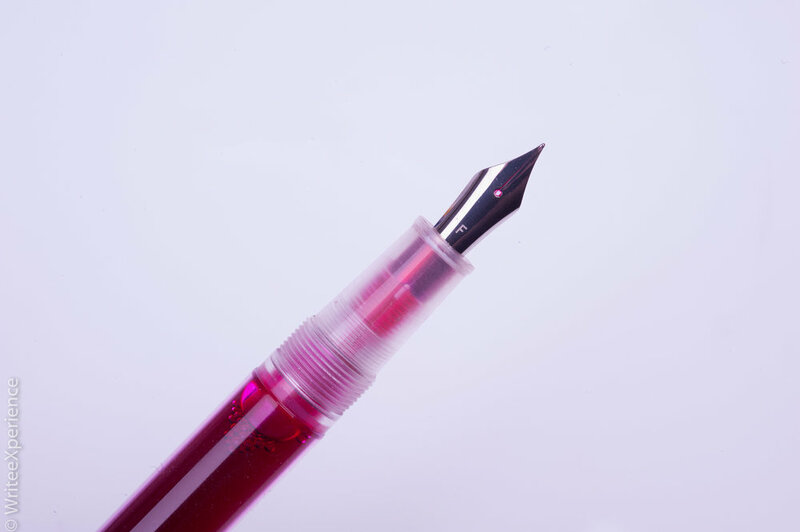 Eyedropper pens have no internal ink storage mechanism, such as a converter or piston, and you fill the entire body cavity with ink. But, I have been less than impressed with cheap steel nibs on inexpensive Chinese pens. Usually, the balance is off, the nib is too wide for my preference, they are often cumbersome, or just generally feel cheap. Not so with this pen! The crisp, fine, steel nib wrote surprisingly well. This pen is acrylic, and the weight and balance were good. 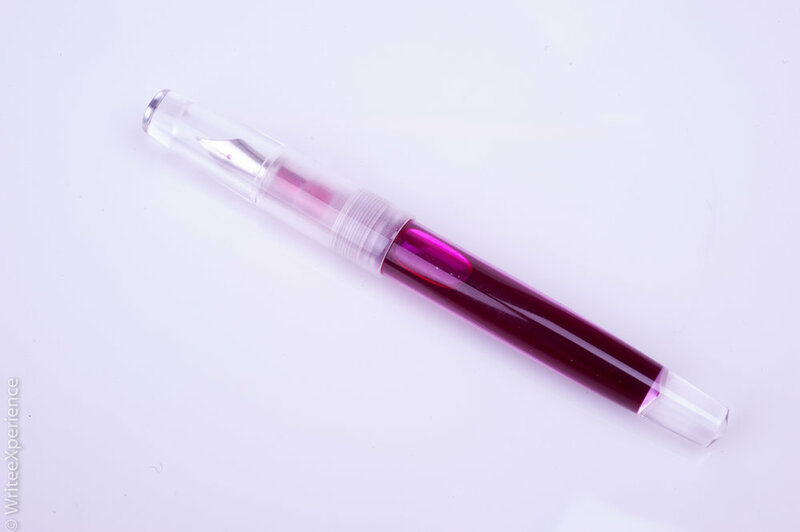 And, perhaps because of the cost savings in not having to supply a converter or piston, the build quality and clarity of the clear acrylic that makes up the pen were far higher than the price would suggest. Lately, my eBay purchasing luck has been hit or miss, but for an investment of less than $20 CDN including shipping, I gave it a shot. I discovered that listings with the manufacturer *Lecai* are more expensive than the same “no-name” pen, though they appear identical. My pen arrived in less than three weeks, which may be a record for Chinese Chinese. The delivery was packaged well and arrived without any imperial entanglements (from our Canadian tax inspectors). I was pleasantly surprised when I opened the package. The pen came in a plastic, rectangular container with two pipettes for filling with ink. As I am used to Jinhao pens being shipped loose (at best), this was a pleasant surprise. I wanted a bright ink to show off the clear body of this pen, and I considered the many shimmering inks I have. Given that I ordered a 0.5mm fine nib, I felt the shimmering effect of the ink would be unlikely to show on the page. Also, I thought there might be flow problems with the fine nib. Instead, I syringe filled the body with Pilot Iroshizuku’s Momiji - a bright crimson ink. Given the volume of ink that this pen takes, I am glad a chose to use a syringe rather than the supplied pipettes. I took a chance and did not seal the threads with silicone. I decided that I could watch the threads of the clear body to look for any leakage and reassess later if needed. I have had this pen for about a month and still have not seen any ink seepage. The ink looks great. It is pretty to have this pen on my desk and displaced a much more expensive pen in my daily carry because of looks and performance. There is always the big question with a sub-$20 pen. How does it write? It writes well! Surprisingly well! Chinese pens are not known for quality fine thickness nibs, but this 0.5mm is the perfect balance of flow and smoothness. It wrote well out of the box and needed no adjustment or tuning. I likely will smooth the nib at some point but tuning the pen is not necessary for a good writing experience. I enjoy the 0.5mm nib. It almost feels like a Japanese style pen. Very impressive! It starts every time and hasn’t skipped at all. I also have not seen any ink evaporation. I recommend this pen. The value is tremendous, as is the look, especially when filled with a fun and impractical ink. For less than $20 including shipping, how can you go wrong?